This article was originally published by the Finnish Institute of International Affairs (FIIA) on 16 January 2018. China-Russia enhanced security cooperation is a form of geopolitical signalling. Despite closer relations, the coming years will tell whether such cooperation is sustainable as the relationship is expected to turn increasingly asymmetrical due to China’s continuing rise. It is unlikely that China’s relationship with Russia would turn into an actual military alliance in the future, however. China’s strategic partnership with Russia is the most comprehensive among its strategic partnerships. The two countries have also enhanced coordination in internationally topical issues. In June 2017, China and Russia signed a general plan for bilateral military cooperation for the years 2017–2020. Over the years, there has been a qualitative improvement since the first two exercises of 2005 and 2007, moving towards interoperability. Joint naval exercises with Russia help the Chinese navy to gain experience in areas further away from the Chinese coastal regions. Arms sales from Russia to China picked up after 2015 when Russia agreed to sell its most advanced technologies to China. The latter will receive the S-400 missile defence system as Russia’s first foreign customer. The delivery date has not yet been published. The China-Russia relationship has global significance. Particularly when united, these two countries could pose a severe challenge to the US and to the broader liberal international order, a sentiment that was clearly articulated in President Donald Trump’s National Security Strategy published in December 2017. The two countries have increased and enhanced their political and security cooperation in recent years. The cooperation takes multiple forms from high-level attendance at each other’s military parades to coordinated foreign policy actions, joint military exercises and even joint development of military equipment. How should we interpret these recent trends? How does this cooperation benefit China, which is a much bigger player economically than Russia and rapidly developing its indigenous defence industry? In an attempt to address these questions, this Briefing Paper duly looks at the Chinese motivations for enhanced collaboration with Russia in the political and security spheres. After the dissolution of the Soviet Union, China’s relations with its neighbour improved considerably. In January 2017 China defined Russia as a “priority in diplomacy” in its White Paper titled China’s Policies on Asia-Pacific Security Cooperation. In December 2017 Chinese Ambassador to Russia, Li Hui, stated that “The comprehensive strategic partnership of coordination between China and Russia occupies a special position in the major-country diplomacy with Chinese characteristics and is an important manifestation of practicing Xi Jinping Thought on Socialism with Chinese Characteristics for a New Era.” These recent developments are remarkable considering the history of the Sino-Soviet split and the fact that the two countries formed their “strategic partnership of coordination” in 1996, only five years after China established diplomatic relations with the Russian Federation. The war in Kosovo accelerated the process of forming closer bilateral ties. Both countries opposed NATO operations in Kosovo as constituting interference in a sovereign state’s internal affairs. In China, public opinion turned strongly against the US after NATO’s bombing of the Chinese embassy in Belgrade in which three Chinese citizens were killed. While China has so-called strategic partnerships with multiple countries, the term “coordination” is reserved for describing the China-Russia strategic partnership. At the institutional level, the mechanisms in China’s strategic relationship with Russia are the most comprehensive and effective. The presidents, premiers and heads of the National People’s Congress and the Duma meet annually. In addition, the two countries have different institutionalized settings for various key sectors, such as the Energy Negotiators’ Meeting and China-Russia Strategic Security Consultation. China and Russia are also founding members of the Shanghai Cooperation Organization (SCO), which was established in 2001 and accepted its first new members in June 2017 when India and Pakistan joined the SCO. Particularly where new members are concerned, the SCO lacks cohesion and its regional importance has decreased. Politically, China and Russia have a common interest in promoting a multipolar world and non-interference in states’ internal affairs. The principle of non-interference is mentioned in their 1997 joint communiqué entitled The Russian-Chinese Joint Declaration on a Multipolar World and the Establishment of a New International Order. In the UN context this preference is manifested in voting behaviour on issues involving military intervention and other forms of interference in states’ internal affairs. Both China and Russia were against placing the human rights situation in North Korea on the UN Security Council’s agenda, for example. Between 2001 and 2012, China and Russia intensified their political cooperation in the UN Security Council and started to show elements of a typical coalition. The two states have, for example, used the double veto more often than before to block US- and EU-initiated draft resolutions. As only one veto would be enough to block a draft resolution, this kind of behaviour can be interpreted as an act of opposition against the dominant Western coalition. The Sino-Russian treaty of friendship signed in 2001 lifted the bilateral commitments to a new level in its Article 9: “When a situation arises in which one of the contracting parties deems that peace is being threatened and undermined or its security interests are involved or when it is confronted with the threat of aggression, the contracting parties shall immediately hold contacts and consultations in order to eliminate such threats”. Perhaps the most significant step on the bilateral front occurred in 2008 when the two countries managed to peacefully resolve their border dispute. In the same year, Chinese and Russian defence ministers also established a direct phone hotline. When Xi Jinping came to power in 2013, he chose Russia as the destination for his first state visit, and became the first foreign leader to visit the Russian military command centre in Moscow. The fact that Xi and Vladimir Putin seem to get along well at a personal level helps in enhancing cooperation, which has become more intimate in comparison with Hu Jintao’s years. After the start of the Ukraine crisis in 2014 followed by Western economic sanctions against Russia, Sino-Russian strategic interests became more congruent. China and Russia have problematic relations with the West, although these relationships represent very different levels of difficulty. Both countries try to diminish Western influences in their respective domestic contexts visible in emphasising traditional values, changing educational policies and increasing censorship. Both must also deal with Western interference with areas regarded as China’s and Russia’s spheres of influence in these countries. While China named support for multipolarity and anti-hegemonism as its foreign policy goals decades ago indicating that it does not accept the US-dominated international order, its various national interests do not make it possible to give unconditional support to Russia in its dealings with the West. Thus, China supported Russia in the Ukraine crisis tacitly for the most part, as its economic interests were against openly siding with Russia. Sometimes Chinese sources close to the military were more openly anti-US describing it as a hegemon unwilling to adapt to a changed world with newly emerging powers. According to such commentaries, the declining US fights to maintain its primacy by strengthening alliances in the Asia-Pacific region to counter China and by pushing for NATOs eastward expansion to counter Russia. However, Russia’s recent actions evoke mixed feelings in China even without the US factor. Justifying the annexation of Crimea based on a popular vote is not exactly a model that China would like to promote considering its problematic domestic situation in autonomous areas such as Tibet and Xinjiang. Regarding the Taiwan question, the Crimean case can be interpreted from multiple perspectives. It can be seen as an example of action based on voting, which would not be in China’s interests in a scenario in which Taiwan would declare independence based on a referendum. Alternatively, Crimea could be taken as a case of a stronger state taking over the territory of a weaker party without much opposition, which could be a useful precedent for China’s future Taiwan policy. Despite somewhat different interests, closer cooperation with China can partly compensate Russia for the difficult international position it has been in, especially since 2014. For China, symbolic support from Russia in the international context can also be useful. Concrete examples of Sino-Russian win-win cooperation are the military parades organized in both countries in 2015. Most high-ranking Western politicians boycotted both events, but China and Russia gave each other face by sending their top men to attend each other’s parades. Xi Jinping was the guest of honour in Russia’s Victory Day parade in May 2015, celebrating the 70-year anniversary of the end of World War II. For China, it was important to have President Putin attend its military parade in September 2015 when most Western countries only sent diplomats or state officials below the top leadership to the event. The China-Russia relationship is arguably better than it has ever been, manifested in political cooperation in key issues of world politics. Since April 2015, the two countries have held regular meetings under the title of the Sino-Russian Northeast Asian security dialogue in response to US and South Korean negotiations on supplying the Terminal High Altitude Area Defence missile defence system to South Korea. In July 2017 Xi Jinping was in Moscow on a state visit when North Korea conducted its first intercontinental ballistic missile test. After the launch, China and Russia issued a joint statement calling on the United States, South Korea, and North Korea to acquiesce to a “dual freeze” solution: North Korea would freeze its nuclear and ballistic missile testing in exchange for a cessation of conventional exercises by the United States and South Korea. Although this initiative received little support internationally, according to the Chinese foreign ministry, China and Russia will strengthen their coordination on the issue. It is rare for China to issue such joint statements. The country’s joint statement with Russia in July 2017 was the first of its kind in ten years issued under the name of both Chinese and Russian Foreign Ministries. Improved bilateral relations facilitate cooperation in the security realm, although the history of military equipment sales from Russia to China has had multiple twists and turns in recent years. Since the Tian’anmen Square protests of 1989, China has been under an arms embargo from the US, the EU, Australia, Canada, Japan and South Korea. Moscow and Beijing signed an agreement on military technology cooperation in 1992, and since then China has bought more military equipment from Russia than from all other countries combined. Chinese orders accounted for 34–60 per cent of Russian major weapons sales between 1999 and 2006. Russian arms transfers to China peaked in 2005 to the tune of 3.1 billion USD, when China accounted for around 60 per cent of Russian deliveries. After 2005 sales declined sharply, however, falling to 0.6 billion in 2016. There were several reasons for these developments. In the 2000s China had more resources to invest in its military, and its domestic defence industry became more developed than before, decreasing the need to buy equipment from Russia. Russia for its part feared Chinese reverse engineering and refused to sell its most advanced technologies to China. There were accusations that China had copied Russian technologies and sold them to African countries and elsewhere. While the increasingly sophisticated Chinese defence industry is a stable factor continuously decreasing Chinese needs to buy equipment abroad, the fact that China and Russia managed to gradually overcome the copyright issues related to defence equipment improved trade relations. One step towards further cooperation after a low tide occurred when China and Russia signed an agreement on intellectual property in 2008 to prevent the illegal copying of technologies. After the copyright agreement, and especially since 2015, Russia has gradually agreed to sell China its most advanced military technologies. 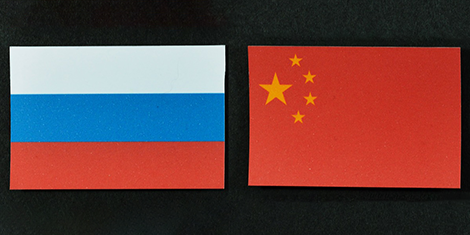 Siemon Wezeman presents two alternative reasons for Russia’s willingness to sell its most advanced products to China, which also currently competes with Russia in arms sales in third markets. Either this was the last chance for Russia to engage in selling military equipment to China or it could be a result of improved bilateral relations. There may be elements of both factors involved. A higher level of trust must have been reached as the parties have been able to move towards joint production in limited areas. In 2011 Russia and China established a joint venture for servicing all Russian-made helicopters operating in China. In 2016, this cooperation was upgraded into a project developing a jointly produced heavy-lift helicopter for China. The two countries have also developed LADA-class submarines, which helps the People’s Liberation Army (PLA) improve its noisy submarine fleet. Moreover, China and Russia have signed several research and development agreements on aero-engine technology, the production of space components and satellite navigation systems. Deals since 2015 include China’s purchase of Su-35 fighter jets, ten of which were delivered in 2016 and the second batch in 2017 with the remaining four scheduled for delivery this year. China has also made an advance payment to Russia for S-400 Triumph missile defence systems as Russia’s first foreign customer to receive this product. The S-400 units will considerably improve China’s anti-access/area-denial capability, which refers to capability consisting of interrelated missile, radar and other technologies designed to deny hostile forces access to the Chinese (coastal) territory. The S-400 could also facilitate China’s installation of an air defence identification zone in the South China Sea, which China also threatened to do in the summer of 2016. In addition, the S-400 improves China’s position with regard to Taiwan, as well as in the East China Sea where China has an air defence identification zone overlapping with those of Japan and South Korea. Depending on where China places its S-400 systems, they will have the potential to alter the balance of power in multiple Asia Pacific hotspots. Naturally, China is intent on becoming self-sufficient in military technology as quickly as possible. In the September 2015 military parade, China showcased its advanced domestic technologies such as the so-called “carrier killer” Dongfeng-21D antiship ballistic missiles. In February 2017, the Chinese Ministry of National Defence reported on China’s successful trial launch of an intercontinental ballistic missile carrying Multiple Independently Targetable Re-entry Vehicles (MIRVs). China is also developing hypersonic glide vehicles, which can enhance its anti-access area denial capabilities. China’s domestically produced fifth generation fighter jets (J-20) became operational in September 2017 according to Wu Qian, spokesperson for the Ministry of National Defence. Although there are still areas in which China benefits from Russian sales, it appears that the time for further trade deals may be limited. In non-traditional security fields, however, China and Russia may find areas in which cooperation benefits both parties in the future as well. Online censorship, for example, is a key policy priority for both governments, and China has lengthy experience with its great firewall. This could benefit Russia, which seems to be taking steps towards decreased liberty in Russian cyberspace. In April 2016, the first China-Russia cyber forum was held in Moscow. Cooperation with Russia helps China to advance its maritime strategy. China’s wider security posture concentrates on improving its maritime strategy and points towards increased overseas engagement as outlined in China’s first military strategy published in 2015. The navy is being formed into an elite force for the People’s Liberation Army. Other examples of maritime concentration include building of new aircraft carriers and the naval base in Djibouti, which was opened in the spring of 2017. The first indigenously built carrier is estimated to be operational in 2020. The 2015 Military Strategy states that “China’s armed forces will further their exchanges and cooperation with the Russian military within the framework of the comprehensive strategic partnership of coordination between China and Russia, and foster a comprehensive, diverse and sustainable framework to promote military relations in more fields and at more levels”. In June 2017 the two countries signed a general plan for bilateral military cooperation for the years 2017–2020. China and Russia have held joint military exercises frequently since the 2005 Peace Mission, which was their first joint exercise involving land, sea and air units. For some years, China and Russia have held their exercises jointly with other countries in the region using the SCO as the organizing body. There has been qualitative improvement since the first two exercises in 2005 and 2007, moving towards interoperability: in 2009 the final stages of the drills involved joint action and in 2013 the air forces trained together for the first time. Joint military exercises give both countries a wider geographical scope than would otherwise be possible. In most of these exercises, the official agenda has been “anti-terrorist” although the implementation has not always matched such scenarios. Moreover, China and Russia have not shied away from politically sensitive geographical areas: the 2014 exercises were held in the East China Sea where Sino-Japanese tensions were running high at the time. The 2016 drills were held in the contested South China Sea. According to Ethan Meick’s report, Russia sent three surface ships, two supply ships, two helicopters as well as amphibious vehicles to these 2016 drills. In addition, training areas have involved the Mediterranean, which is far away from China’s territorial waters. In July 2017 Chinese and Russian troops held a joint naval exercise in the Baltic Sea, followed by another exercise in the Sea of Japan in September. For China, joint maritime exercises have multiple motivations. In addition to political reasons for enhanced cooperation with Russia, China needs to secure shipping lanes as its commercial interests are widespread across the globe. China became the world’s number one crude oil importer in 2017 and PLAN may need to participate in securing commercial or energy shipments in the future. The largest oil suppliers to China are Middle Eastern countries such as Saudi Arabia, Iran, Iraq and Oman, as well as Angola and Russia. From Russia, there are direct pipelines to China but part of the Russian oil sales are still transported via sea routes. PLAN also has a lot of catching up to do in operating in seas far away from its own coastline. China has participated in anti-piracy operations near Somalia since 2008, but beyond that PLAN has little experience of operating out of Asia. The three areas of cooperation discussed above demonstrate a trend of increased and enhanced Sino-Russian coordination. Russia has sold China its most advanced military technologies, and although weapons sales have their limits due to China’s rapid domestic development, future cooperation in the form of joint production is possible in areas not restricted to helicopters. Moreover, cooperation is already underway in areas of non-traditional security, such as cyber security. Asia is a large and important market for the Russian military industry and Russia naturally avoids placing all of its eggs in one basket by continuing to sell arms to India and Vietnam, which is not in China’s interests. Russia also conducts military exercises with other Asian countries in addition to China. Nonetheless, recent sales of military equipment to China combined with sophisticated military exercises taking a wider geographical scope than ever before serve as an efficient form of geopolitical signalling. Despite deepened cooperation, China and Russia are not allies and any formal military alliance between the two countries is not in sight either. This is mainly due to the widening gap between the two countries’ respective global power positions. China’s relative rise will continue, whereas Russia’s position is likely to decline. A formal alliance in the foreseeable future under the increasingly asymmetrical power balance would push Russia to adopt a subordinate role, which it will be unlikely to accept. However, as long as opposing the US or the West more broadly forms congruent interests, the Sino-Russian marriage of convenience will prevail. Feng, Zhongping and Jing Huang. 2014. “China’s Strategic Partnership Diplomacy: engaging with a changing world.” European Strategic Partnership Observatory. http://fride.org/download/wp8_china_strategic_partnership_diplomacy.pdf. Accessed 30 October 2017. Creutz, Katja. 2017. “Human rights in the shadow of nuclear arms control.” In Sinkkonen, Elina (ed.) The North Korean Conundrum. International responses and future challenges. FIIA Report 52, 94–96. Monteleone, Carla. 2015. “Coalition building in the UN Security Council.” International Relations 29 (1), 58. Soldatkin, Vladimir. 2013. “In Moscow, new Chinese leader Xi warns against meddling.” Reuters 24 March 2013. http://www.reuters.com/article/us-china-russia-moscow/in-moscow-new-chinese-leader-xi-warns-against-meddling-idUSBRE92M02F20130324. Accessed 6 November 2017. Wu, DD. “Russia-China Relations Reach a New High.” The Diplomat 7 July 2017. https://thediplomat.com/2017/07/russia-china-relations-reach-a-new-high/. Accessed 30 October 2017. Wezeman, Siemon. 2017. “China-Russia Relations and Regional Dynamics.” SIPRI, 86; Rajagopalan, Rajeswari Pillai 2017. “China-Russia Relations and Regional Dynamics.” SIPRI, 89–90; SIPRI Arms Transfers Database https://www.sipri.org/databases/armstransfers. Accessed 1 November 2017. Kaczmarski, Marcin. 2015. Russia-China Relations in the Post-Crisis International Order. New York: Routledge, 71–73. Wezeman, Siemon. 2017. “China-Russia Relations and Regional Dynamics.” SIPRI, 88–89. TASS 20 June 2016. “Work on Russian-Chinese heavy helicopter autonomous from 3rd countries — deputy PM.” http://tass.com/economy/883574. Accessed 7 November 2017. Meick, Ethan. 2017. “China-Russia Military-to-Military Relations: Moving Toward a Higher Level of Cooperation.” US-China Economic and Security Review Commission. TASS 2 February 2017. “Russia may supply ten Su-35 fighter jets to China in 2017.” http://tass.com/defense/928577. Accessed 31 October 2017; “Exports of Russia’s S-400 missile systems.” TASS 9 October 2017. http://tass.com/defense/969682. Accessed 31 October 2017. Chinese Ministry of National Defence. http://eng.mod.gov.cn/DefenseNews/2017-02/06/content_4771779.htm. Accessed 7 February 2017. Saalman, Lora. 2017. “Factoring Russia into the US-Chinese Equation on the Hypersonic Glide Vehicles.” SIPRI Insights on Peace and Security. No. 2017/1, 1–12. Xinhua 28 September 2017. “China’s J-20 fighter jet put into service: spokesman.” http://news.xinhuanet.com/english/2017-09/28/c_136645789.htm. Accessed 7 November 2017. Drennen, Skylar. 2017. “What Does China’s Status As Largest Oil Importer Mean For U.S. Interests?” The Fuse. http://energyfuse.org/what-does-china-status-as-largest-oil-importer-mean-for-us-interests/. Accessed 3 November 2017. Elina Sinkkonen is a Senior Research Fellow at the Finnish Institute of International Affaris’ Global Security Research Programme.